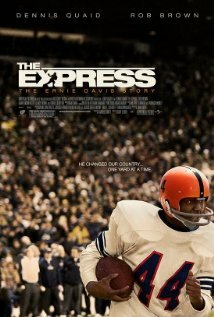 In honor of this auspicious occasion (it looked there for awhile that we might not see much NFL football this year), last night we pulled out “The Express” DVD that I gave Papa awhile back. What an inspirational story! We were impressed again with the courageous hearts of both Ernie Davis (Rob Brown) and Syracuse University head Coach Ben Schwartzwalder (Dennis Quaid) as they tackle so much more than football on & off the fields of the 1950s. There’s so much more to this movie – overcoming adversity, discrimination, a snapshot of the challenges faced down by early African American football players – but my favorite part is how the team changes & how Coach Schwartzwalder changes. His half-time ‘pep talk’ during the Cotton Bowl lays it on the line: “this is not just about football. This is about making history…for ALL your teammates.” There’s also a love interest, Sarah, and more to tug your heart strings as Ernie Davis signs on to play for the Cleveland Browns, but…you might need a hankie or two by the end. This entry was posted in MOVIES !! and tagged Ben Schwartzwalder, Ernie Davis, Football, Inspirational athletes, The Express. Bookmark the permalink.